Lockable doors, with lever handle, 3 point locking system. Doors open 180° (padlock not included). Shelves adjust on 2-1/2” centers. Legs allow moving of unit with fork lift truck. Includes four 14 gauge reinforced shelves with 1-1/2” lips. 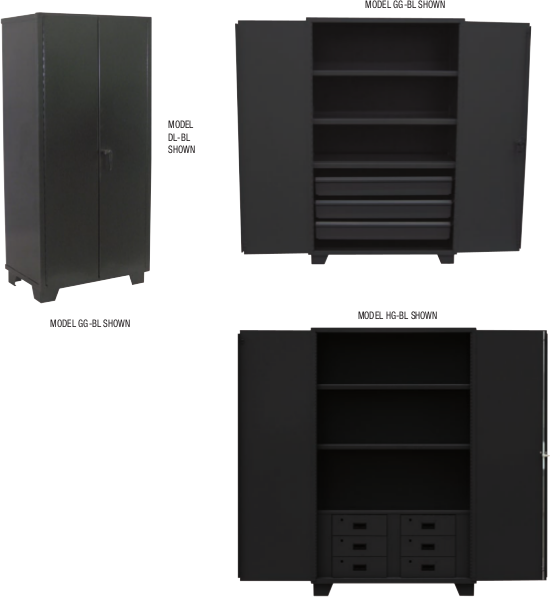 Three drawers 36” Unit - (5”h x 30”w x 20”d); 48” Unit - (5”h x 42”w x 20”d).